Southern Illinois University Edwardsville celebrated its 2017 Spring Commencement exercises for 1,957 graduates Friday and Saturday in the Vadalabene Center on campus. All the ceremonies are available on siue.edu/tv. After Chancellor Randy Pembrook addressed the Graduate School, School of Business and School of Nursing students Friday night, he bestowed degrees upon the Graduate School and School of Education, Health and Human Behavior graduates Saturday morning, the College of Arts and Sciences (CAS) in the first afternoon session, and concluded with the School of Pharmacy, CAS graduate students and the School of Engineering early Saturday evening. He spoke about significant decision-making. The morning student speaker was Melissa Sue Beyer, who earned a master’s in psychology. She encouraged the graduates to expand their experiences. 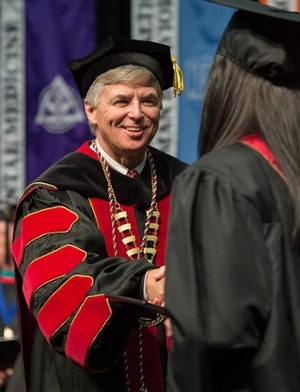 “If you take anything from my experiences, it is to go outside your comfort zone,” Beyer said. “That is where the growth happens. That is how we each evolve as a person, an academic and career professionals. Renowned architect Gyo Obata was honored with the University’s Distinguished Service Award during the morning ceremony. Unable to attend the event, Obata expressed his appreciation in a video. In 1955, Obata co-founded Hellmuth, Obata + Kassabaum (HOK), the largest United States-based architecture/engineering firm. In the early 1960s, Obata was commissioned to design the new SIUE. 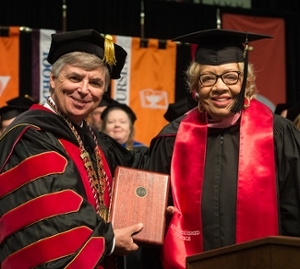 SIUE emeritus professor and former administrator Johnetta Randolph Haley also was honored with the Distinguished Service Award during the afternoon ceremony. “Never give up on anyone – miracles happen every day. Never deprive someone of hope, because it may be all that they have. LaShaunda Jordan, who earned a bachelor’s in mass communications, was the student speaker for the afternoon session. An Air Force veteran and mother of three children, Jordan expanded upon the story of the Tuskegee Airmen and the societal challenges they overcame to be eminently successful. “Stepping up to the plate when there are strikes against you is never easy,” Jordan said. “I’ve learned from the Airmen’s example the importance of believing in myself. No matter how ugly things look or how many people are waiting for me to fail, I must believe in me, and Class of 2017, you must do the same thing and believe in you. Veronica Delgado, who earned a master’s in art therapy counseling was the final student speaker, closing the day. The daughter of Cuban immigrants, Delgado urged people to be willing to accept challenges and make difficult decisions, even when you doubt yourself. “When I began challenging myself to make decisions about my life based not on my ability, but on my willingness, I realized that rarely, if ever, did I actually feel confident,” she said. “The truth is I never did feel all that confident or capable. You just have to keep choosing, to keep being willing and one day you make it. Friday’s student speaker was Mia Frogner, a native of Oslo, Norway, who earned a bachelor’s in business administration while also serving as a standout contributor to SIUE’s undefeated 2017 Ohio Valley Conference women’s tennis champions. She focused on the support she received on campus as an international student. 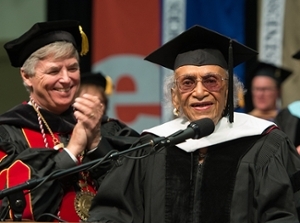 Frankie Muse Freeman was awarded an Honorary Doctor of Humane Letters Friday night. Freeman has spent her lengthy career advocating for civil rights issues that have had a lasting impact at the local, regional and national levels. In 2007, Freeman was inducted into the International Civil Rights Walk of Fame for her leadership role in the civil rights movement. In 2011, she received the National NAACP’s highest honor, the Spingarn Medal for outstanding achievement by an African American. Photo: SIUE Chancellor Randy Pembrook (upper left) applauds as Frankie Muse Freeman addressed graduates at the 2017 spring commencement ceremony after she received an Honorary Doctor of Humane Letters. Middle: Pembrook with Johnetta Randolph Haley. Lower: Pembrook congratulates a graduate.